Common names: Narrow-barred spanish mackerel, spanish mackerel, striped mackerel, tenggiri batang, tohok, dengkeh. The narrow-barred spanish mackerel is another pelagic belonging to the “razor gang”. They sport an impressive set of razor-sharp teeth, capable of removing trolled live/dead baits without registering so much as a twitch to the line (not an over-statement). The spanish mackerel is an extremely fast and powerful fish and puts up an impressive fight when hooked much like a wahoo. Adult (read huge) spanish mackerel usually hunts alone or in very small group. Smaller Spaniards can be found in schools. They are seldom found far offshore making them easily accessible to game fishers and commercial netters alike. 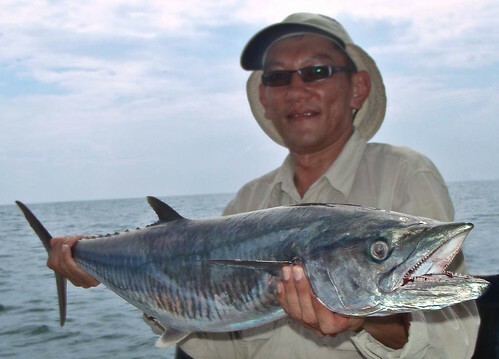 Spanish mackerel are often caught trolled with live or deadbaits and also on lures and metal jigs. They are sometimes considered as bait-stealers to game boats targeting Billfish. Another method of catching them is by drifting live bait fish or squid near surface. The spanish mackerel’s incredible speed often results in them rocketing meters out of the water when attacking from below. Snelling is often deployed when using two hooks on a live or dead bait. For trolling live bait, a treble is usually used as a stinger hook. There are also imaginative anglers deploying a spinner plus dead bait combo with much success. Bibless lures are trolled at high trolling speeds for spanish mackerel. But I have found different methods works better at different situations and environments. Multiple hook-ups are common when a troll goes near a schooling spanish mackerel. If a big fish is landed, that is usually the only fish in that area. Big spanish mackerel are capable of making sizzling runs after getting hooked. If a sport fish usually puts up a fight by swimming away from the angler, be ready for the highly unpredictable directions a spanish mackerel might make. They often swim towards the boat at high speed making the angler think they have lost the fish. Reels with a smooth drag are essential for fishing them and they normally swim near the surface during the run seldom sounding the bottom. A medium or medium fast rod is more forgiving for catching these speedsters and certainly more enjoyable. Wire leaders above 20-30 lbs are usually needed to combat the razor-sharp scissor-like teeth of the spanish mackerel. Nylon coated wires are also popular when trolling. If nylon leaders are used, you can only hope for the best that the fish has bitten at the lure or hook shank. Another thing is there can be a lot of hits & misses with the spanish mackerels as they tend to attack bait at high speed. Often, a bait is sliced clean in half but the fish misses the hooks. They also often hit the leaders rather than the lure or jig sometimes getting themselves foul hooked.